Digital transformations are complex change projects with the goal of making an innovation. How can real value for stakeholders be created in such a project? With strategies, agility, an overview and control. The framework for digital transformation in objectiF RPM ensures traceability along the entire value chain. From strategy analysis and requirements engineering to solution design, implementation and evaluation, the framework supports your agile, iterative approach. Digitization projects are complex. In order to lead teams optimally and make the right decisions, you need an overview in real time. Individually configurable project plans, backlogs and dashboards provide you with the basis for secure project management. Structure requirements, architecture and processes with models. Use document templates for artifacts and patterns to plan recurring tasks. Define workflows for reviews and tests. The framework offers you methodical and operational support for your digitization projects. objectiF RPM‘s digitization framework suggests structuring your broad digitization project in initiatives. This structure enables you to keep large change projects under control, even with multiple teams and a broad functional scope. Digitization projects are often confronted with progressive technological development. Today, agility is the way to go to deal with changes quickly and constructively. That’s why the digital transformation framework supports both classical planning and agile planning with initiatives. Executing and scaling a change project requires almost no effort with the framework for a digital transformation: the easy-to-use planning patterns let you set up the project, create initiatives, plan releases and sprints and add new teams when you need to. The project plan is updated automatically. The digital transformation framework introduces strategy analysis from the get-go – a lot earlier than other solutions. It supports problem analysis, establishment of the innovation need and the value being created, development solution options and analysis the effects of processes. The defined value chain need for innovation – solution – value is the foundation for a common and coordinated procedure in collaboration with the stakeholders. The framework spans from strategy analysis and requirements engineering to the solution draft, implementation, solution analysis, right up to service. This means that all the results are recorded identically and that the process is standardized. In addition to process quality, features for reviews and test management ensure a quality product is produced. The need for innovation recognized on the strategy level must be developed from concrete requirements to the level of user stories. Goals and goal conflicts have to be clarified, the solution scope has to be delimited and the solution option has to be developed. These steps are the object of requirements engineering and are a central component of the framework support. All developed results are subject to version control. Development states are also recorded with baselines. The automatic history enables versions to be compared and, where necessary, restored to an earlier state. Saving result relationships ensures traceability over the entire development process – from the need for innovation right up to the code. International standards for business analysis and requirements engineering as a methodical foundation you can rely on. Stakeholders and their needs, i.e. problems and opportunities that stakeholders recognize. In the next step, concrete implementable requirements are derived from the results of the strategy analysis. This is followed by classical requirements engineering and system design activities. Requirements are refined and at the same time the design of the solution is defined. Since technological progress is rapid, requirements in digitization projects are often highly volatile. In order to keep track of changes and dependencies, professional requirements management with versioning is indispensable. A preconfigured structure for managing the design and implementation artifacts of modern service-oriented architectures. So you don’t lose any time in the project. Lightweight Model-Driven Development (MDD). Artefacts with their relationships to each other as well as to requirements and user stories are visualized. The developers thus receive the necessary orientation for their tasks. Model-based, automatic implementation of the architecture through directories with source code files. This ensures sustainable adherence to the applied architecture style. Requirements traceability down to code. This is because the revision of a completed user story is always accompanied by a reference to the corresponding revisions of the source code files. In this way, the code of the current revision can be compared with the code of the previous revision and the implementation of the user story can be traced. Solution development is strongly dependent on the technology stack used. Using script-based extension functions, the model-driven implementation can be adapted to the project-specific technology stack. Solution evaluation usually leads to change proposals that are captured and managed with the software. Change requests can be evaluated with regard to possible risks and made more precise by requirements. They then flow directly into the iterative planning of future sprints or maintenance activities. One of the biggest challenges of digitization change projects – especially when serving as a basis for an organization’s new business model – is the high level of management complexity. The digital transformation framework helps you master these challenges with multi-level planning techniques. Afterwards, a broad change project will be structured into multiple agile or classical initiatives. The initiatives’ structure should guide you towards the need for innovation that was determined during strategy analysis. Backlogs, planning views, evaluations (e.g. Cumulated Flow Diagram) can be created. The repository structure is prepared for storing the results and dragging baselines. Requirements Engineering according to IREB. Precise requirements are required for innovation. The need for it at a strategic level must therefore be detailed through requirements up to the level of user stories. Goals and goal conflicts between stakeholders must be made visible, the scope of the solution must be delimited and the solution options developed. These steps are the object of requirements engineering and a component of the framework’s support. 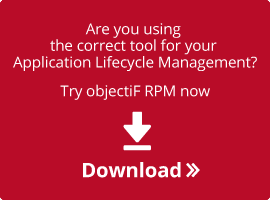 You can learn more about the functionality of objectiF RPM, as well as things independent of the framework for a digital transformation, here. objectiF RPM is an integrated platform for executing projects with multiple teams. It supports cooperation between internal and external partners of an organization, both locally and remote. 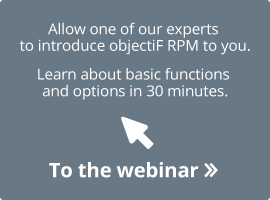 Whether it’s with a Windows client or in a web browser, on premises with wifi or in the cloud – the architecture of objectiF RPM provides a variety of options for your project organization. Learn more about the tool architecture here.